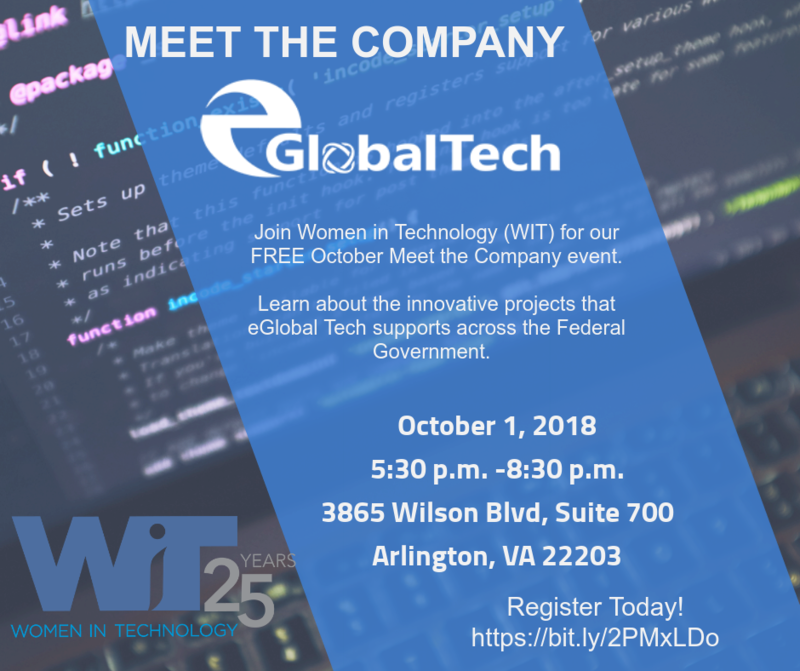 Please join eGlobalTech (eGT) and Women in Technology (WIT) for our “Meet the Company” event! Connect and network with our executives and recognized thought leaders, discover what new career opportunities are available to you, and learn about the innovative projects that eGT supports across the federal government. In addition, hear from our leaders about what it is like to work for eGT within their respective account areas. We will have tasty finger foods and beverages available for attendees. Bring a few copies of your most updated resume. The attire is business casual. We can’t wait to meet you! Check out some of our latest thought leadership blogs and projects! eGlobalTech is a leading IT, cybersecurity, and management consulting firm in Arlington, VA. Our focus is to provide the public sector with innovative solutions, leveraging cutting-edge tools and methodologies to meet the federal government’s most pressing business needs. eGlobalTech was founded in 2004 by Sonya Jain, who was a visionary leader and a WIT award winner. In honor of Sonya’s legacy, we are dedicated to progressing women forward in technology. Pre-registration for this event has closed, but walk-ins are welcome!